Built with Newland’s fifth-generation of technology, the scan engine can decode even poor quality barcodes with ease. Ultra-compact, light and integrator-friendly, the NLS-EM3296 caters for miniaturization needs of OEM applications. The NLS-EM3296 supports USB and TTL-232 interfaces to meet diverse customer needs. 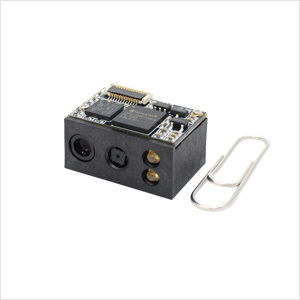 Seamless integration of image sensor and decoder board makes the scan engine small, lightweight and easy to fit into even the most space-constrained equipment. The advanced NLDC technology incorporated in the scan engine helps reduce the powerconsumption and prolong the service life of the device. Self-service cabinets used in e-commerce,express delivery services and smart homes; ATMs; kiosks; queue machines;lottery machines; certificate makers. Software development board, equipped with a trigger button, beeper and RS-232 & USB interfaces. USB Used to connect the NLS-EVK to a host device. *Test conditions: T=23℃; Illumination=300lux using incandescent lamp; sample barcodes made by Newland. 2D: QR Code; 10 Bytes; Resolution=15mil; PCS=0.8.